People who have HIV in their bodies are ‘HIV-positive,’ and will develop AIDS if not treated with drugs. Most of the world’s people still do not have access to these life-saving drugs that allow HIV positive people to live long and relatively healthy lives. Without treatment, people who contract HIV generally continue to feel healthy for 5-8 years, before getting seriously ill and dying. exchange of blood through means such as the re-use of un-sterilized needles, blood transfusion, improperly sterilized tattooing, piercing, or medical equipment. HIV cannot be transmitted through any kind of casual contact including sharing food, toilet seats, or exchanging saliva during kissing. 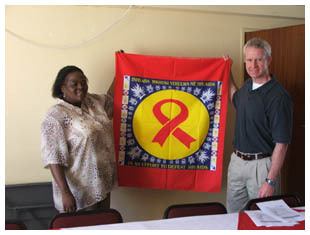 If you would like to learn more about HIV/AIDS, please click here.